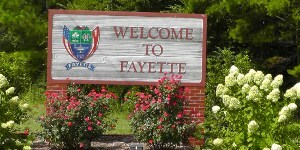 Fayette has a variety of seasonal and on-going events that make it a special place to visit any time of the year. From the Art Museum and Civic Center to the summer days at the Aquatic Center to the fall activities of the Art Festival and Frog Level to the winter time Christmas Lights tour to the frequent weekend events, Fayette has a lot of excitement to see and things to do. Art Festival – Sponsored by the Art Museum, this annual event is held at the park where painters, sculptors and other artisans display their work to the public.Art, food, fun and even puppy dogs are to be had at this annual event that is unique to Fayette among small towns. Art Museum – Year round display of over 2,500 pieces by many artists. Civic Center – Available year round for weeding, business meetings, family reunions and other special events. Every summer Dogwood Productions presents the plays “Come Back To God America” and in the winter “The Gospel According To Scrooge”. Frog Level Festival – Every fall the city celebrates the history of old Fayette by holding week-end activities that have included such attractions as antique car shows, balloon rides, 5k runs. Fayette Aquatic Center– it’s summertime fun with water. Christmas at the Park is a driving tour of the park as it is decorated for the Christmas season. Tunes on Temple is a pleasant way to spend a summer evening listening to the music of area bands while visiting with friends. Multi-Plex Building hold many week-end events throughout the year. Check the Calendar for upcoming events. Festival of Trees December 1 through December 31. Local artists, businesses, schools, and collectors design their own Christmas tree to be displayed for free throughout the Christmas season. Opening Reception will be Sunday, December 1, 1:30-3:00 pm at the Museum/Civic Center.